Southern Bluebird Day: Subway Tile Backsplash Reveal! I'm back, and so excited to share my latest spur-of-the moment project with you! 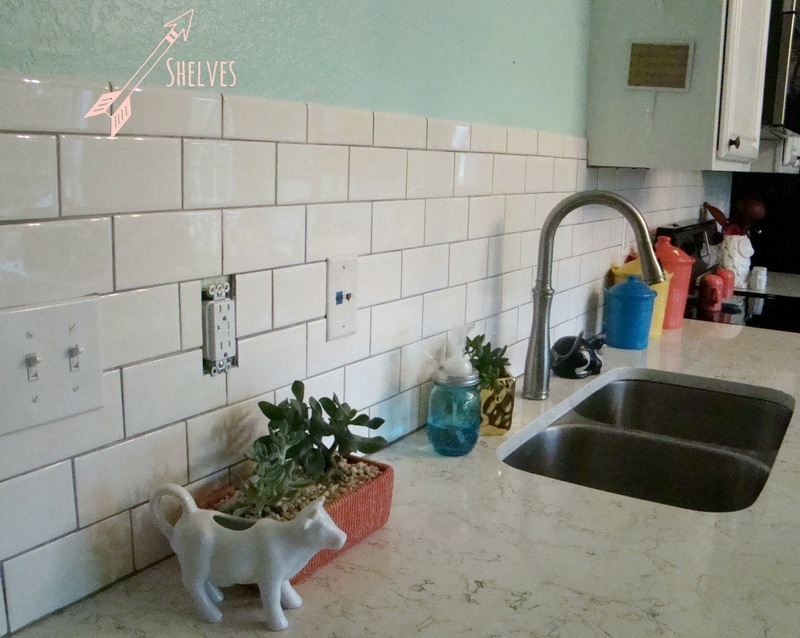 I shared a little tease on my Facebook page a couple weeks ago of the subway tile backsplash I started on a whim. See, it all started because I was out of hand soap in the kitchen. 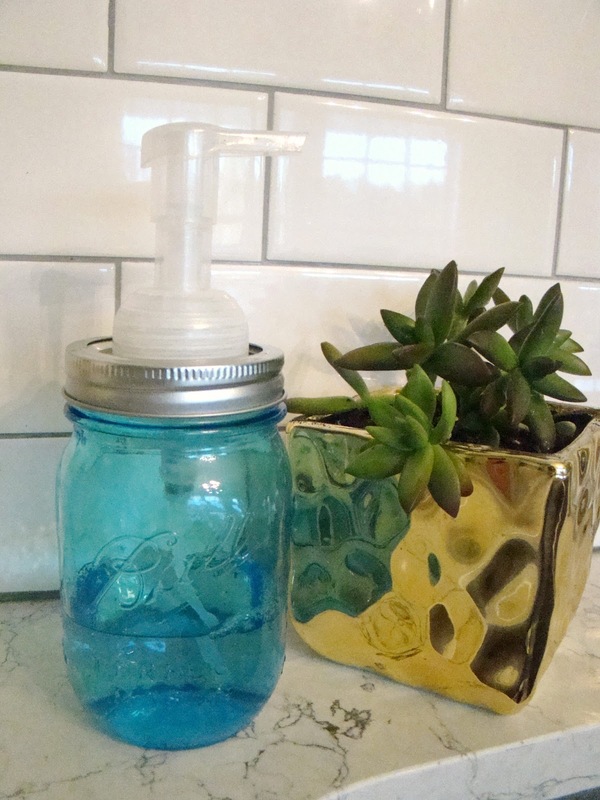 When I went to refill the cheap faux Mason jar dispenser I'd bought at Hobby Lobby a while ago, it basically fell apart in my hands from all the rust. Gross. I had been wanting to make my own soap dispenser from an extra Mason jar anyway, but I needed a soap pump and a waterproof adhesive. I thought to myself, "I can run over to Home Depot, grab some soap and glue, and just look at the tile. I don't have to buy any. Ok, I can buy one case just to have. I don't have to start on it today." I think it's obvious that didn't go according to plan. I left there that day with not one, but TWO cases of white 3x6 subway tile and all the necessary supplies to tile my own backsplash. And did I even make a soap dispenser when I got home? Yes, actually I did. But not before throwing a bunch of tile on my wall first. 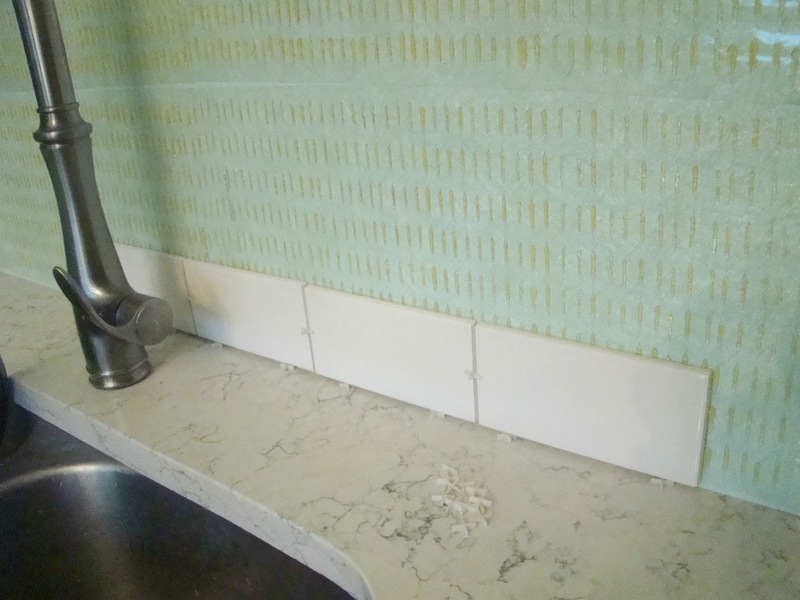 This was my first tile project, and I had been putting it off out of intimidation. 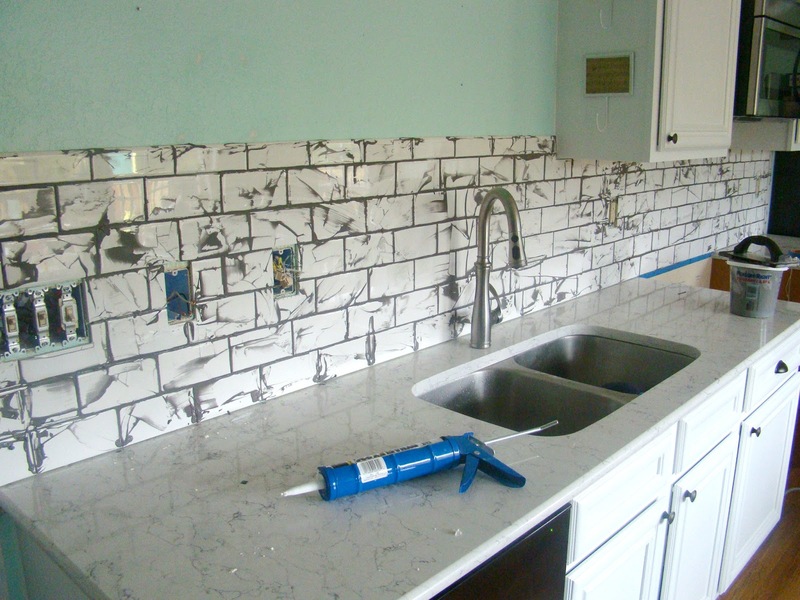 But I have a few friends who have recently done some backsplash work, and they assured me I could do it. First I did tons of research. I decided not to use thinset or mortar to apply my tiles. Instead, I chose to use the SimpleMat Tile Setting Mat. It is more expensive than mortar, but it was insanely easy to use and there was absolutely no mess. Since this was my first attempt, I really wanted it to be idiot-proof. It was so wonderful and easy to use! I would absolutely use this stuff again. 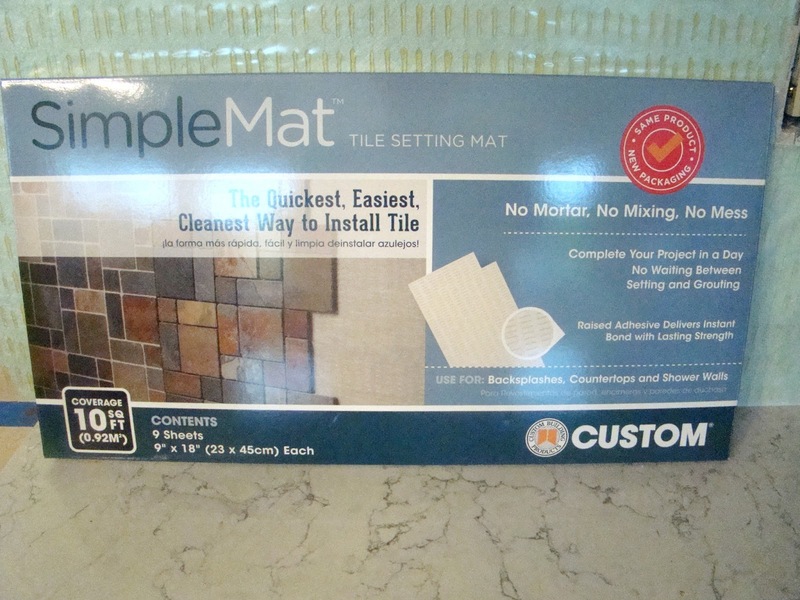 The tile setting mat has two sticky sides, one for the wall and one to stick the tiles onto. First, I covered my whole wall and left the front sticky-side still covered by the paper. You can cut it to fit as needed around your outlets and underneath cabinets. It will get your scissors kind of gunky. It comes in boxes that cover 10 square feet, or in a roll that covers 30 square feet. They were out of the roll the day I went, so I ended up using three of the boxes. Not the most cost efficient way to do it, but whaddya gonna do when you're spontaneous and crazy? I also realized I never painted the sides of my cabinets where the stove lives. Should I?? I feel like I should just for completion's sake, but do I really want to create more work for myself?? Bless my heart. Also, if you want to be grossed out, just pull your stove away from the wall. You'll discover dirt and garbage you had no idea was lurking in your kitchen. I digress. After I placed the mat, I started laying my tiles on. Most things I read said to start in the middle and work your way outward. I used 1/16" spacers between my tiles because I wanted the skinniest grout lines I could get. I don't have a tile saw, and I don't plan to buy one. I won't be doing much (if any) more tile work in this house, and it would've been a waste of money. Renting one was an option, but also pretty expensive. I did buy a tile cutter like this one for $20, and that was super helpful. It scores the tile then breaks it along that straight line. It was perfect for cutting the edge pieces. My issues began when I reached outlets and corners around my cabinets. I knew that my local Lowe's would cut tile for me (my Home Depot would not), and I took five, YES I SAID FIVE, trips down to Lowe's to have it cut. Mostly that was my fault. You kind of have to measure as you go so that you get the perfect measurement, and I couldn't really measure ahead. A couple times my measurements were off, and one time they didn't cut them very straight. Lowe's is 3o minutes from my house, so that was the worst part of the project. At least the tile guy there is my new bestie. One late night, I made a trip down to Lowe's to have some skinny slivers cut to go right underneath my cabinets. As soon as I got home, I dropped one of the pieces on my countertop, and it broke into four little pieces!!! The despair was real, y'all. I had already been back and forth so many times! So in my despair, I stuck those broken pieces back on the wall and grouted them in! The struggles of a DIY life. But I doubt anyone will notice unless I tell them to lean over and look in that corner. 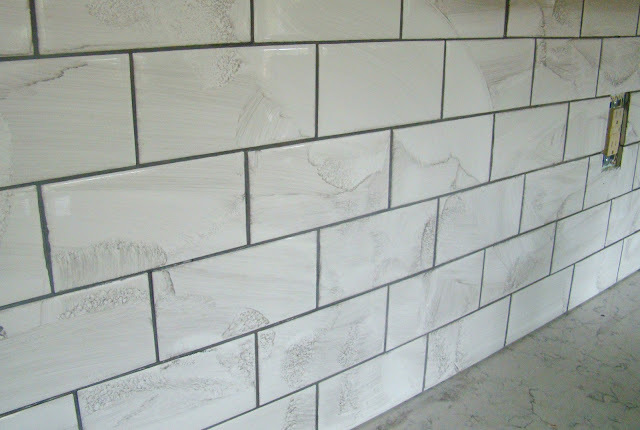 When I finally got all my cuts made, it was time to grout. I chose a medium gray grout color to tie in the dark hardware on my cabinets, and because I liked the contrast. The gray I chose was Delorean Gray (and I started this project on Back to the Future Day - 10/21/15! How fitting!). I mixed the grout according to the directions on the package and put in on using a grout float. 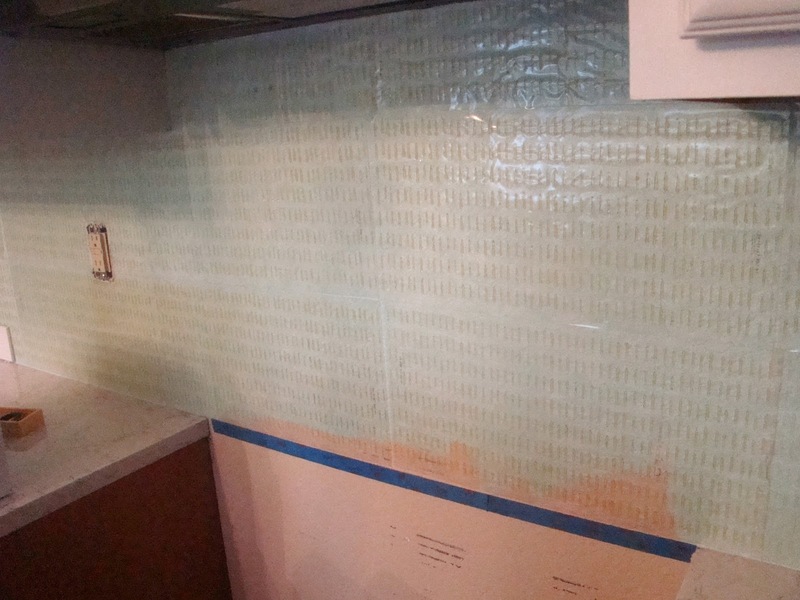 I also used my hands a fair amount to get the grout into edges and corners where the float wouldn't reach. Don't worry about those exposed wires! I had the breaker off at that point. Once all the spaces between the tiles were filled, I started wiping off the excess grout with a big fluffy, damp sponge. This part felt like it took a million years. I rinsed my sponge several times, and just kept wiping tile there was no grout left on top of my tiles. I also tried to scrub a little at my grout lines so they would be as skinny as possible. 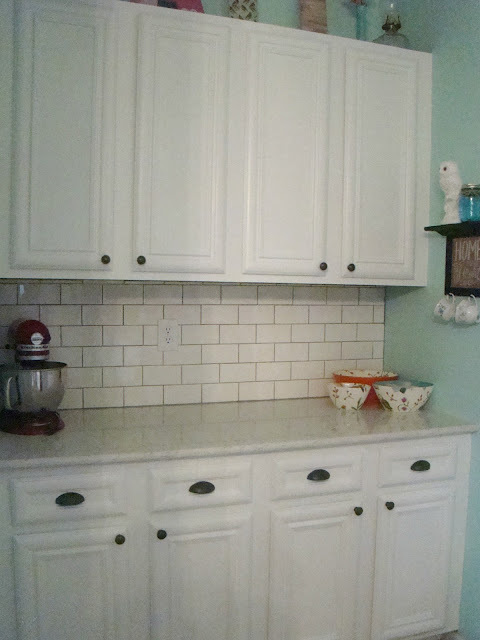 I let the grout dry until the next day, then I replaced my outlet covers, caulked around the seams, and voila! A finished backsplash! I actually had to replace all of my light switches, outlets, and GFCI outlets, as well as the outlet covers. They original ones were almond (builder's beige of course! ), and I wanted white. And finally, the finished product! There are some areas where it's obvious it was a DIY job, but I'm so pleased with how it came out! I think it helped to brighten up the kitchen even more and give it some serious character. I still need to replace one more outlet cover, but I couldn't wait to share! I still have a few things in mind for this space, but it's mostly aesthetic touches now. I want to add some floating shelves to that random open area in the photo above. I need to find a new home for my key storage box, and I plan to create an actual coffee bar soon too. Most of all, I'm proud of myself for taking on a major project like this! It's really great for my confidence to know I can actually get it done, and on a budget! Please let me know what you think in the comments or you can visit my Facebook or Instagram to chat! Have a wonderful week! Amazing job! I'm so proud of you - I would pay you to put up a backsplash at my house!! I will gladly take you both up on those offers! Look at you go! I'm so impressed. 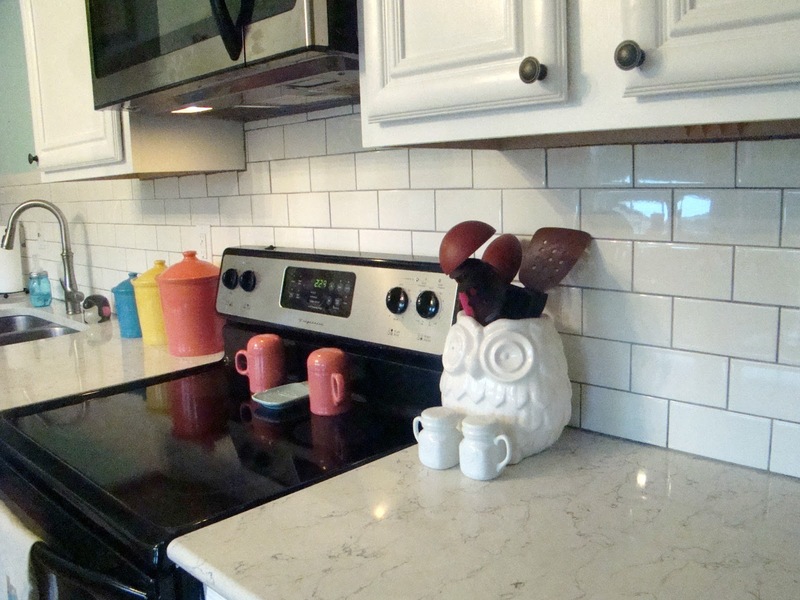 You can do the backsplash at my house one day. 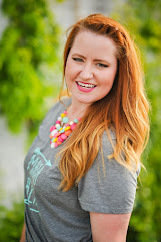 I'm Callie, and this is where I share my crafty projects and colorful room updates to our boring builder's grade home. Our house isn't perfect, and most of the pictures hang crooked, but there is always beauty in imperfection.